I’m delighted to be reviewing this fabulous book today. 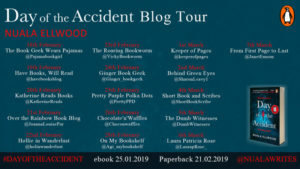 My thanks to Ellie Hudson from Penguin for asking me to be a part of the blog tour and for sending me a copy of the book for review purposes. her daughter is still alive? I really enjoyed Nuala Ellwood’s 2016 debut, My Sister’s Bones, so I jumped at the chance of reading Day of the Accident, her second novel. I found this one so compelling that I read it (400 pages) in the space of a day which is quite unusual for me. It’s a book that I couldn’t put down. It’s so easy to read and yet so full of depth. Maggie Allan is in a coma when the book begins, and she’s just starting to show signs of coming out of it. But the news that awaits her is the worst she can imagine. Her ten year old daughter, Elspeth, is dead. She drowned when the car she was in, Maggie’s car, plunged into the water. Maggie tried desperately to save her but couldn’t and now she can’t remember anything about what happened that day or why she was by the river at all. Of course, the memory loss storyline has been done many times before but it works so well in providing a protagonist with a mystery to solve and that’s what happens in Day of the Accident. Maggie is absolutely determined to find out why her daughter is dead. To top it all, her husband, Sean, is now missing. Why? Nobody knows. As I say, I absolutely raced through this book. It’s addictive reading. Maggie is on a bit of a collision course, wandering into situations that may or may not be dangerous, may or may not trigger a memory, may or may not help. There are people around her whom she trusts but is she right to do so? I thought to myself as I hurtled towards the end of the book that I really didn’t know what was going to happen. I had a slight inkling but Ellwood does an excellent job of building up to the surprises. Like many psychological thrillers, it’s slightly far-fetched but also not impossible. If you read the news you know that strange things happen every day. 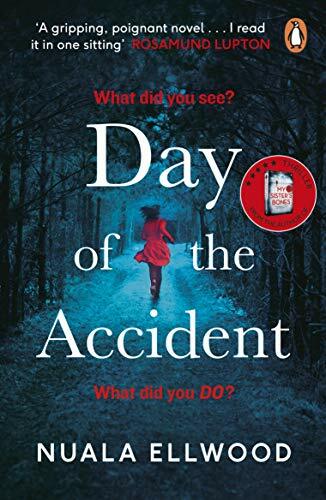 Day of the Accident is gripping and thrilling, intriguing and full of suspense. I loved it. 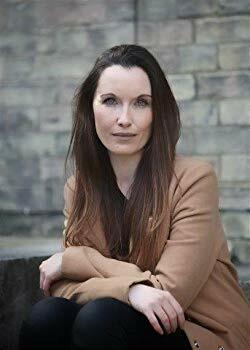 Nuala Ellwood is the author of two bestselling novels: My Sister’s Bones for which she was selected as one of Observer‘s ‘New Faces of Fiction 2017’ and Day of the Accident. Nuala teaches Creative Writing at York St John University, and lives in the city with her young son.